Texas Governor Rick Perry’s speech on March 7 to the annual CPAC (Conservative Political Action Conference) meetings was described by various news web sites as “a barn burner address” that wowed the conservatives, as “a rousing speech that was one of the best-received of the conference so far”, as a “fiery speech that ignites CPAC”, as a speech that brought “the audience to its feet and eliciting loud cheers”, and that “received huge applause throughout his rousing speech”. Rick Perry has been Governor of Texas for more years than any other governor in Texas history. He was elected Lieutenant Governor in 1998, and became governor in December 2000 when George W. Bush resigned to become President of the US. Perry was then elected governor in his own right three times (in 2002, 2006, and 2010), the first Texas governor to be elected to three four-year terms. He is not now running for a further term, and thus will step down following the election later this year. It is widely assumed he will once again seek the Republican nomination for the Presidency in 2016, and many interpret his CPAC address as confirming this. He is well known for the failure of his 2012 campaign seeking the Republican nomination, when he quickly went from front-runner to quitting following a series of goofs. The best known was in one of the debates with the other Republican contenders, when he said he would close three cabinet level departments in the federal government but could only remember two, in his famous “oops” moment. Perry’s speech at CPAC set forth what will likely be a major theme of his upcoming presidential campaign: the contrast between the great performance (in his view) of red states (conservative states that generally vote Republican) and the terrible performance of blue states (liberal states that generally vote Democratic). As the longest-serving governor of the premier red state of Texas, it is not surprising that Perry would say this. But what has the performance actually been? The graph at the top of this post presents one key measure: real GDP per capita, presented as a ratio to the US average. Texas is shown (in red), along with two of the top blue states: Massachusetts (in blue) and New York (in green). The figures are calculated from data issued as part of the GDP accounts by the Bureau of Economic Analysis (BEA), which provides such data at the state level GDP on an annual basis (with 2012 the most recent available). The current series goes back only to 1997, before which the state-level figures were calculated on a different basis, and thus are not directly comparable to the later figures. But 1997 is also the year before Perry was elected Lieutenant Governor, so it provides a suitable starting point. 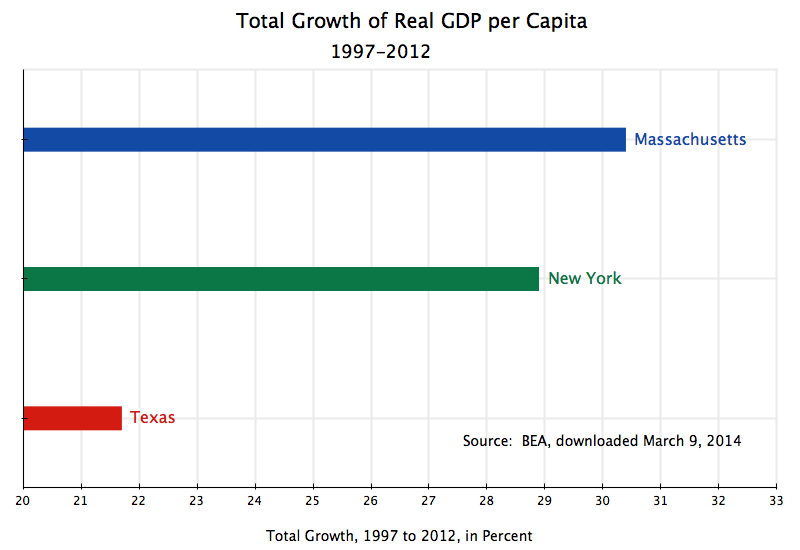 As the graph shows, real per capita GDP was substantially higher in Massachusetts and New York than in Texas in all of these years. Indeed, per capita GDP in Texas actually fell relative to that for the US as a whole from 1998 to 2005 (meaning growth in Texas was slower than in all of the US over this period), after which it started to recover. The oil boom resulting from the sharp escalation in oil prices from the middle of the last decade was certainly a factor helping Texas in recent years. Once again one finds this measure of income to be far higher in the blue states Massachusetts and New York than in the red state of Texas. But what is different and interesting is that personal income per capita in Texas is seen to be also below personal income per capita for the US as a whole. A higher share of GDP generated in Texas goes to corporations than is the case for the US as a whole. GDP per capita in Texas is somewhat above the US average (although not as much above as in Massachusetts or New York), but personal income per capita, once one subtracts the share going to corporations, is lower in Texas than for the US as a whole. Conservatives, including not surprisingly Governor Perry, hold up Texas as the ideal which they want the nation to emulate. 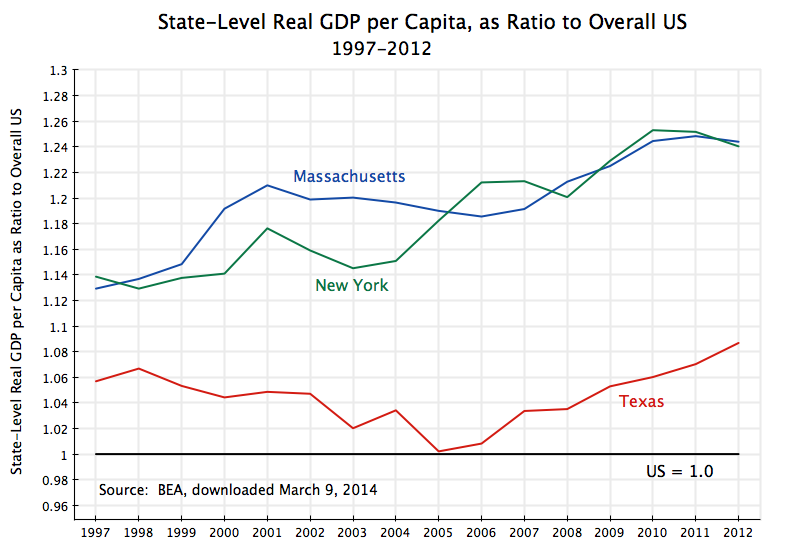 But GDP per capita is lower in Texas than in the blue states of Massachusetts and New York, and has grown by less in Texas than in Massachusetts or New York over at least the last fifteen years. 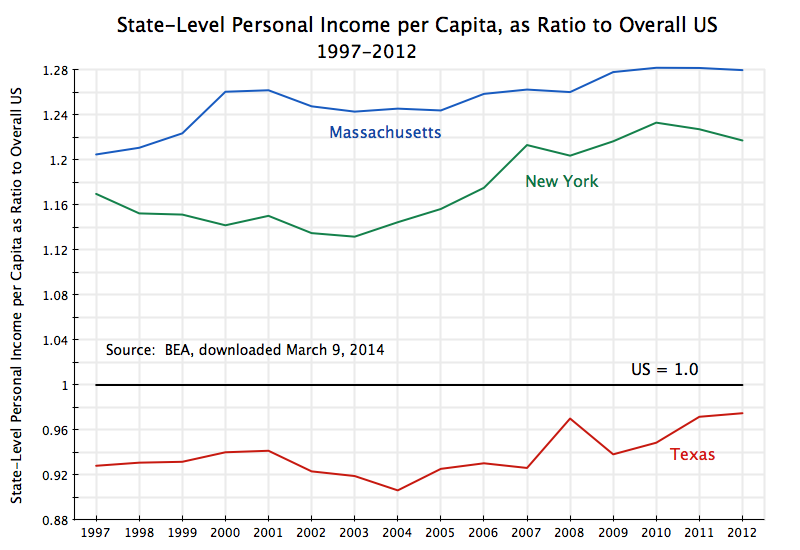 In addition, personal income per capita is not only lower in Texas than in Massachusetts or New York (and very much lower), it is even lower than the US average. Corporations account for a disproportionate share of incomes earned in Texas. Perry closed his speech to CPAC, to cheers and loud rounds of applause, by declaring that the federal government should “Get out of the health care business, get out of the education business”. Presumably this means Perry wishes to end Medicare, and that federal government assistance to students and schools up to and including universities should also end. It is not clear, however, he has thought this far ahead on the implications of what he is calling for. Calling for the end of Medicare, as conservatives have in the past, is not currently a popular position. But while Perry said the federal government should “get out” of health and education, one area where he appeared to call for expanded federal responsibility was in the running of the postal system. The proper federal focus, as established in his reading of the constitution, should be on defense, foreign policy, and to “deliver the mail, preferably on time and on Saturdays”. The constitution does indeed call on the federal government to ensure postal services are made available. But while this was done through a cabinet level department under the US President for many years, since 1971 the postal service has been run as a government-owned but independent establishment, run like a private corporation with its own board. It is not fully clear what Perry means by arguing the federal government should return to its original mission vis-a-vis postal services, but the implication appears to a be reversal of its 1971 conversion from a cabinet level department to an independent agency run along private lines. That would be an odd position for a conservative. But I suspect he has not really thought this through. This entry was posted in GDP & Productivity, More Political than Economic and tagged economic growth, GDP, Republican campaign, US politics by aneconomicsense. Bookmark the permalink.